and official successor to the work I began, is now here! Version 0.2b: Minor fixes, including added friendliness with Weapons and Armor Fixes. Also now the main download requires Revenge of the Enemies because 0.2a conflicted with it on some Draugr. The second download does not. 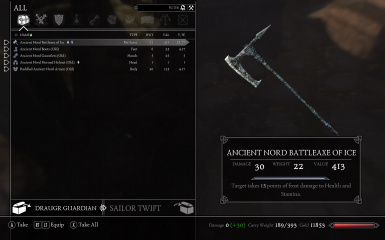 New version will remove any Ancient Nord Hero items you have when you replace the ESP - see comments for instructions to replace them via console. A big update is on the way. 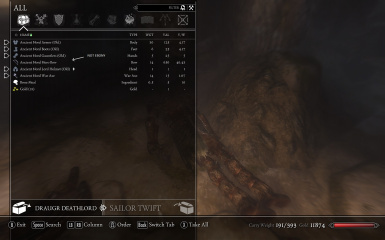 The Problem: Morrowloot 4E Edition is awesome, but is lacking patches for all the awesome mods that we can't play Skyrim without. Also, Draugr Deathlords drop Ebony weapons like crazy in the higher levels (yes, almost as much as vanilla). The author suggests finding another mod to handle enemy level scaling, but that doesn't fix the fundamental problem that too many draugr drop ebony. 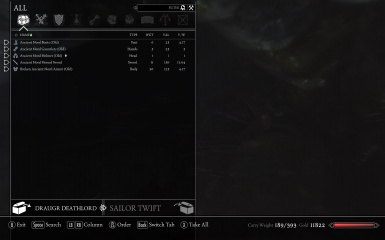 With my patch, you can now play Morrowloot 4E Edition alongside Skyrim Immersive Creatures and Warmonger Armory without adding inappropriately high-level gear to the leveled lists and loot. High-level, non-boss Draugr no longer drop Ebony gear, keeping Ebony rare even in high level gameplay. This lets your Morrowloot playthrough include the kind of extra items and enemies that modders are used to. I will also show what additional mods to use and how to construct the ideal Morrowloot 4E Edition mod configuration. Ebony Re-Morrowloot-ified: Draugr drop too many Ebony weapons at high levels, even with Morrowloot 4E Edition installed. I found this particularly disappointing because M4E handled gear so well everywhere else. Ebony should continue to be rare in high level gameplay. I fixed this by going through every Draugr in both Immersive Creatures and vanilla Skyrim, by hand, and making sure they had Morrowloot-appropriate inventories. Generally, only high-level bosses can have Ebony gear, while regular high-level Draugr like Deathlords and Reapers will not. For them, I created a new tier of Ancient Nord weapons with slightly different models that's better than Honed but not quite as strong as Ebony. This means any SIC or vanilla draugr spawns, even those added by other mods, should be appropriately Morrowlooted. Warmonger Armory rebalanced and integrated: Warmonger Armory adds a lot to a Skyrim playthrough and blends in perfectly, but needs tweaking to fit in with M4E. Firstly, some of the gear has been nerfed in order to let it stay in the leveled lists and have a role in your playthrough. Nord Hero gear is no longer better than Ebony, for example, and will show up in the same places as Steel Plate. In short, I've repurposed Warmonger Armory to compliment a Morrowloot 4E Edition playthrough. 1. Download and install Warmonger Armory with the leveled lists. Now's the best time to run Loot or whatever. 2. Place Morrowloot.esp, with Morrowloot LWE.esp right after, below anything else that modifies loot. 4. Run Wrye Bash to make a bashed patch, leveled lists only, and place it after M4E Expansion Patch.esp. And that should do it. Below is also important so make sure to keep reading. If you use another mod that uses its own Uncapper settings, like SPERG (I do), cut its Experience Gain Multipliers in half. The reason this is important is that a Morrowloot playthrough greatly enhances the early leveling experience. You still grow your character plenty quickly, and found gear plays a much more important role in your character's development. More Appropriate Loot: Scarcity, recommend 2x or 4x Merchants and 4x or 6x Loot. Otherwise, normal Skyrim treasure will make you too rich. Enemy Difficulty: Revenge of the Enemies, Combat Evolved, Duel - Combat Realism, Dragon Combat Overhaul, and Deadly Dragons. The first three produce something really beautiful for regular enemy combat and the last two are the classic dragon combo. Revenge is particularly important for making bosses significant. Don't forget the SIC patch. Enemy Level Scaling: Encounter Zones Module from T3nd0's Skyrim Redone. Simply download the main file manually and extract only the file "SkyRe_EncounterZones.esp" in the folder "07 - Ecounter Zones." You do not need anything else from SkyRe for Encounter Zones to do its thing (and its thing is awesome). with Trainwiz's rare item placements. De-leveled Quest Rewards: No Leveled Item Rewards changes quest rewards like Chillrend and Nightingale Armor to always come at max level. Obvious and essential to a Morrowloot profile. Potion Balance: Immersive Potions - I consider this essential and underrated. This does exactly what potions need because pausing a battle to chug fifteen Minor Health Potions at once is retarded. In fact, I plan to upload a patch to compliment Immersive Potions much like this one in the future. ALPHA BUILD: Although I was quite thorough, this patch is not yet fully tested. I'm pretty sure it's complete. Feedback from users will help graduate this to a full release. FUTURE PLANS: I plan to add aMidianBorn Content Addon and High Level Enemies in the future. I'm not even sure if anything in High Level Enemies needs Morrowlootified anyway. If people like my patch, I'll release more of my esoteric patches, as well as the Immersive Potions patch I mentioned above.